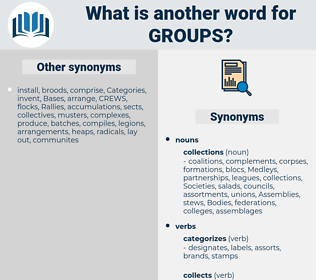 What is another word for groups? 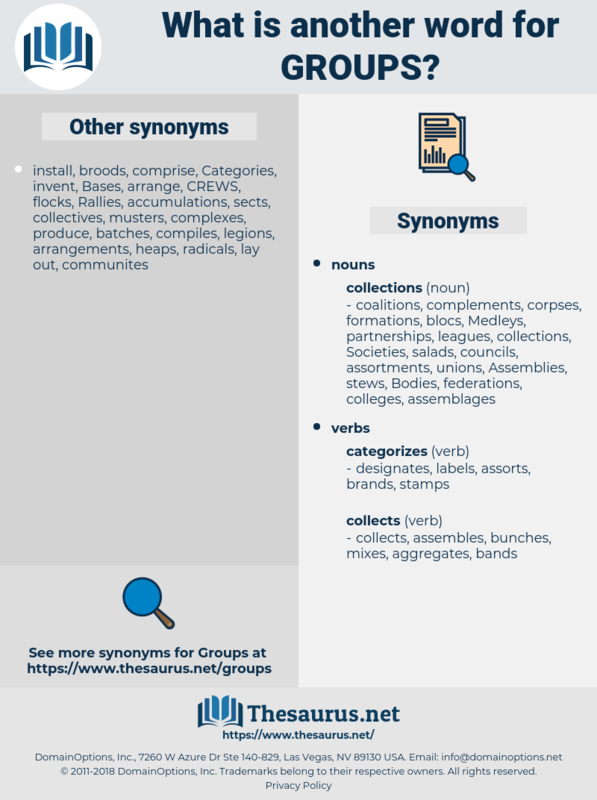 groupements, groupings, panels, groupes, clusters. groupings, panels, panel, groupes, clusters, cluster. Charities, brackets, subgroup, sub-group, category, Categories, unit, units. 'groups, subgroups, sub-groups, workgroups, conglomerates, contingents, delegations, corporations, committees, consortiums, congregations, denominations, coalitions, Movements, outfits, troupes, networks, collective, collectives, aggregations, assemblages, combinations, gatherings, forum, cohorts, alliances, syndicates, gangs, partnerships, cliques, groupings, Branches, Strata, circles, cadres, militias, affiliates, suites, batches, herds, blocs, councils, Clumps, Tribes, panels, brackets, women, consortia, panel, party, Parties, category, Categories, units. Companies, audiences, Canadians, NGOS, teams. authorities, organisms, concentration, federation, differential, segments, difference, NGOS, ministerial, peer, organs, complex, Tribes, interest, advocacy, standard, Entities, turkey, des, debate, women, hiv, base, baby, teams, S, grupo, party, Parties, task. grupos, battlegroups, sub-populations, guerrillas, multinationals, co-operatives, sub-committees, subpopulations, years, purposes, Companies, supporters, configurations, subcommittees, qualifications, sub-subsectors, collectivities, portfolios, producers, representations, agreements, operations, suppliers, representatives, factors, Minorities, agglomerations, deputations, Programs, Granting, computers, experts, constellations, Generations, proportions, Concentrations, portions, personages, Workshops, chairpersons, programmes, courses, collaborators, Governments, regulators, Possibilities, Opportunities, belonging, positions, interveners, enterprises, transactions, Operators, represents, directorates, federations, collections, commissions, projects, consignments, cooperatives, periods, fundamentalists, professions, concerns, Regulations, generators, Resources, providers, implications, dissemination, Industries, Personalities, Respondents, pairs, caseloads, perspectives, accomplishments, aggregates, platoons, components, jurisdictions, operatives, arrangements, stakeholders, Undertakings, professionals, compilations, Journals, roundtables, tours, Environments, organisers, departments, Specialists, regions, consolidations, presentations, Majorities, origins, terrorists, Languages, situations, collectors, Consultations, chapters, employers, fractions, coordinators, quarters, Nationalities, indicators, responders, numbers, Grants, matters, Firms, Beneficiaries, topics, rings, regiments, terms, heading, headings, Businesses, offenders, spectators, customers, ranges, prevention, allegations, PODS, affiliations, Occupations, powers, differences, consumers, troops, Guidelines, leaders, relations, pillars, instalments, Soldiers, provinces, governors, issues, competencies, P, constituents, Mutations, Households, sources, sectors, tiers, discussions, tranches, others, participants, orders, accusations, priorities, spheres, statistics, Moieties, extremists, Palestinians, peoples, declares, volunteers, stripes, confessions, Areas, Cultures, Measures, seminars, definitions, modules, clientele, clienteles, composites, specially, traffickers, questions, militants, partners, structures, ethnicities, clearly, advocates, Couples, speakers, clubs, elements, initiatives, Accessories, Rallies, disciplines, transmitters, remnants, players, lobbyists, boards, stocks, offers, strengths, applicants, armies, individuals, Brochures, cooperation, L, columns, personnel, activists, breakouts, species, compounds, Disabilities, Sports, habitations, recipients, Persons, occasions, sects, backgrounds, terrorism, Difficulties, visitors, rooms, complexes, directions, panellists, formations, steps, subsets, Rights, exports, dollars, settlements, scores, promotions, immigrants, Drugs, mergers, owners, informants, Adolescents, rebels, mechanisms, combatants, Carriers, rounds, disorders, relevance, encounters, audiences, things, obstacles, electors, channels, findings, colleges, unions, quotas, officials, workers, delegates, users, bulges, PAGES, -rrb-, observers, interests, crowds, decisions, strategies, seniors, fields, earners, existing, nations, Excluded, ways, chambers, fringes, Trainings, pockets, referees, classrooms, rafts, actors, cartels, increments, CAMPS, packs, diapers, officers, instances, points, flocks, Standards, Students, Achievements, Chips, inhabitants, stages, wings, means, guys, cores, Universities, Interviews, minutes, features, problems, conflicts, employees, buckets, artists, IMPACTS, police, Patches, ottawa, Colonies, islamists, chains, Lobbies, strips, practices, clothes, villages, residents, barriers, Pupils, targets, figure, figures, defenders, works, Charges, levels, settings, people, methods, Phases, Forms, Facilities, Bandits, Activities, sides, voters, increases, Habitats, sites, Migrants, tables, combines, currents, posts, notes, objectives, names, contacts, swathes, parts, 2002, admissions, ranks, Patients, changes, subjects, Policies, streams, arms, slices, Efforts, events, members, layers, blocks, technical, offices, payments, trades, services, months, boys, Rats, bunches, trusts, _, faiths, elite, Elites, agents, media, Ones, inuit, farms, TAPES, models, Cells, aids, skills, tanks, needs, waves, acts, cases, manuals, funds, traits, trends, Diets, ages, opinions, slabs, Studies, tensions, Canadians, lots, teachers, plates, Children, items, Races, themes, games, results, titles, Plants, tyres, kits, Entries, moves, 21, Clients, publics, citizens, Biases, ties, totals, 2003, 1998, towns, Diseases, flows, masses, arts, heads, 2010, Motions, B, who, men, Tracks, ", states, Travels, views, stands, Bays, cycles, hands, Females, 42, data, sexes, Risks, :, weeks, Lives, authorities, 34, east, shifts, links, meeting, Drives, Goals, organisms, 2001, segments, NGOS, organs, LINEs, Entities, teams, S.
We passed through different rooms where groups of ladies were assembled. Fossiliferous groups, table of succession of.